As my taste in film develops with age, I find myself drifting ever closer to works with a French origin, yet always from a unique source. My knowledge of director Christophe Gans’ efforts like Silent Hill and Brotherhood of The Wolf can be tied back to my years of video games and love for Mark Decascos respectively. Being an animation fan has led me towards the works of Sylvain Chomet like The Illusionist and The Triplets of Belleville. While I was writing this, I found out that director Luc Besson was the writer behind many American films that I enjoy like Taken and The Transporter series. 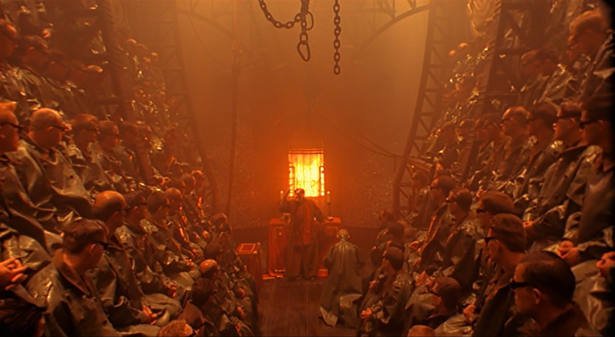 Which constituted my experience with French film before watching tonight’s review of 1995’s La Cité Des Enfants Perdus (The City of Lost Children), I do hope that this will be enough to do this film justice. 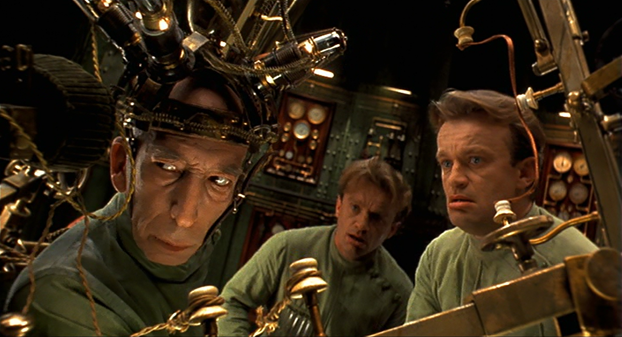 The City of Lost Children was directed by both Marc Caro and Jean-Pierre Jeunet, who previously joined forces to create Delicatessen back in 1991. Since then, Marc Caro directed Dante 01 and not much else; where Jean-Pierre Jeunet went and took charge of Alien Resurrection, Amélie, and recently MicMacs. They both tend to frequently cast actor Dominque Pinon anytime post Delicatessen. La Cité Des Enfants Perdus is a harbor side town fortressed in brick walls, clothe lines, and countless alley ways. Flyers concerning missing children plaster the walls; with rumors spreading around that the religious zealot group known as the Cyclops (identified by their single working robotic eye and their extremely sharp hearing) are behind the kidnappings. But while people understand who is taking them, they do not know for what reason. In paid transactions, the representatives of the mad scientist Krank work with the Cyclops to gain enough children for Krank’s experiments. See, by using children’s dreams they try to and manage Krank’s inability to dream, Krank’s necessity for young children stirs confrontation between his workers/family and the film’s lead/ the film’s standout, the gorilla-like redhead Mr. One. Mr. One’s role is of a side-show strongman, whose presenter is stabbed by a mugger during a performance where One attempts to break the chains wrapped around him. After breaking free from the failed stunt, Mr. One brings his (maybe) dead boss to their stage-coach house, being accompanied by his adopted younger brother Denree. But as One watches over his boss’s (maybe) unconscious body, members of the Cyclops break into and kidnap Denree. One gives chase but loses them, after which he stumbles upon a gang of orphan’s led by a curly-haired young girl named Miette. After a few successful robberies constructed by two conjoined twins called the Octopus (some assisted by One himself), Miette decides to help One find his little brother. Confrontation between the Cyclops and Krank’s family awaits them. 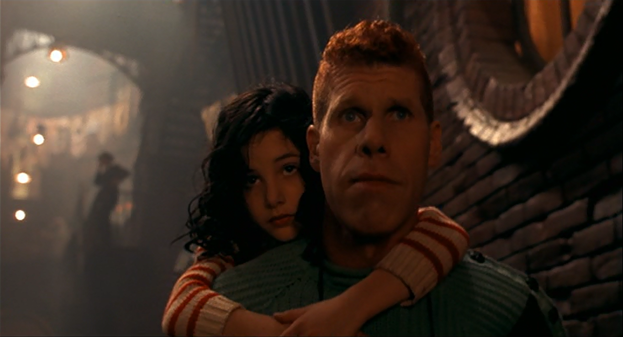 City of Lost Children is very character based and this is helped by the great acting. Mr. One is portrayed by Ron Pearlman, who was the only American in the cast. His character’s brutish but child-like amalgamation speaks in the third-person and is not abased to literally bruising the scenery. This contrasts with his small companion Miette with her stoic and no-nonsense attitude. Evil scientist Krank is snarky and scary, but at the same time likable. Actions bubble wonderfully from Daniel Emilfork’s performance, his villainy controls the otherwise benign fellow clones that live with him, all creations by the same genius scientist, where some look more like fully grown identical sextuplets, one that is the artificial pint-sized scientist’s wife, and a talking head in a jar named Irvin. They follow his lead because they want to see him happy. However, it just happens to that their actions can be construed as evil. 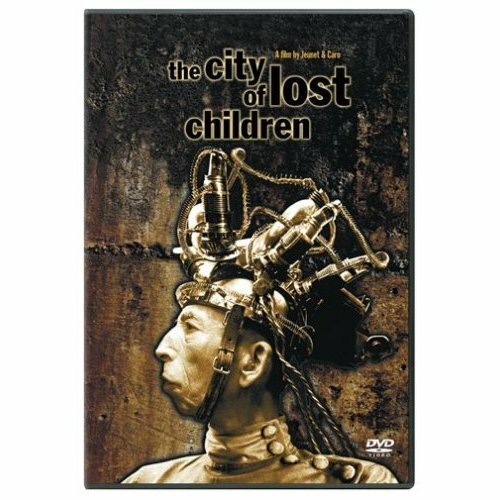 What makes City of Lost Children stand out the most is the set design and costume design, making this film all the more distinctive. If I am to compare the main set to others, I would say that this port city reminded me of both the town square from Batman Returns and the in-studio Lake Lachrymose from A Series of Unfortunate Events (both done by set director Cheryl Carasik). The landscape feels like the inside of one large soundstage because everything looks closed off and the shots of the sea are narrowed by far off matte paintings. I recently visited a fashion gallery by French designer Jean-Paul Gaultier, where I was able to see his original sketch designs for Miette’s red dress and the clones’ copper green suits (and I got close enough to Ruby Rhod’s leopard suit from The Fifth Element to almost knock it over). The clone colors fit the green lab interior and the designs for the Octopus tried to incorporate two outfits that were connected by the same center foot they shared. Pros: Certain scenes, for instance an early fairy tale told by Irvin giving back story to his fellow clones that causes Krank to start crying, are just beautiful to behold for how personal they are delivered. The film has this underlying comedic tinged underlining its serious tone making it all the more absurd; similar to the original La Cage Aux Folles in allowing itself to pull a quick joke from scenes you would not expect. The violin filled soundtrack is a perfect mood setter. Cons: I addressed earlier the final fate of One’s boss, who is completely forgotten once the film started flowing. This stuck with me because this film is filled with concepts that fit like four teeth sided puzzle pieces trying to make a coherent image. Like a very long word wrote out in cursive that you awe at before it stops, City of Lost Children has an ending that runs out of steam. For the most part you are enthralled by its phantasmal elements and at times whimsical approach, but the ending is disappointing because the film just seems to stop. The release that I found was put out by Sony Picture Classics. The City of Lost Children is like those haunted house designed theme park rides that keeps you in an enclosed seat to take you on a personal ride. 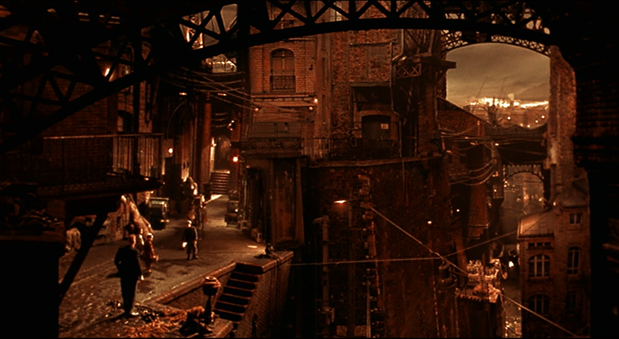 But like a ride where construction/build-up starts to take a toll at the very end of the line, so does The City of Lost Children crash into a wall. I can say that it’s more of the journey then the destination with this one. Do not let the venom less ending influence everything before, because there are just so many beautiful things to see in The City of Lost Children that it would all be a waste to turn it down, just do not expect a grand finale.